In the following I've put together some useful commands for image processing that I used again and again in the last few years. They might be interesting for the technically oriented, ambitioned DSLR user working under Linux. The command line tools might come in handy for users of the SmaTrig presented on doc-diy.net. All program packages mentioned are open source or freeware - no money or criminal activity necessary! First of all I strongly recommend to bookmark this web page for a detailed help on imagemagick. The imagemagick package is a collection of extremely powerful tools for command line image processing providing the mighty convert. As the name implies it lets you convert different formats, resize images, append, crop, slice... There is virtually no operation not covered by convert. All that works in a second or two. This package is a MUST and probably already installed with your distribution. Just type convert to check. By the way, most of the graphical elements of this web site were created per script using convert. lets you control the JPG quality between 0 (pain in your eyes) to 100 (maximum). Fine JPGs directly from a DSLR have a quality of about 97. Values less that 80 will result in a the early 90ies jpg look. Values between 85 and 95 are a good compromise. The option -strip removes all extra data from the file header (EXIF etc.) and saves usually 1-4 kB (very important when creating thumbnails!). The options -strip and -quality can be used separately of course. Check the convert documentation for more help on resize. Very often a whole batch of images have to be resized. Here a bash loop is helpful. The sequence below resizes all images in the current folder with names starting with 'img' and ending with 'jpg'. The resized images are stored in the folder 'myfolder' (must exist before command is launched) and have an extra 'm' as prefix. Adjust the search pattern (regular expressions after 'for i in') and the naming of the new files to your needs. '$i' contains the name of the file currently processed. A whole chain of commands can be added following this scheme. for horizontal appending (note the + before append). Simple -- isn't it? Note that the backslashes are necessary to escape the brackets. There must be also spaces around the brackets.The backslash stands for a new line. Check the convert documentation for more help on append. Cropping images is usually a visual process requiring a GUI. Command line cropping becomes necessary when working on hundreds of images like in time lapse movies where you try to match a common resolution like 1080p but don't want to scale down by just a few percent. Here the 200x100 means that a section of 200 px in the horizontal direction and 100 px in the vertical direction will be cut out. The second pair of numbers specifies the offset counting form the top left image corner. Possible directions are Center, NorthWest, North, NorthEast, West, East, SouthWest, South, SouthEast. Check the convert documentation for more info on advanced cropping. This loop will process all files with the extension 'jpg' in the current folder and store the output images in the folder '900' with the additional prefix 'm'. Don't forget to try mplayer -vo aa movie.mpg. Refer to the documentation for details. Execute the script in the folder where the original images are. 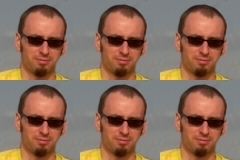 The script with generate the same number of images with the prefix trail_. You can directly download it here. Don't forget to make it executable by typing chmod u+x star_trails.sh. Below is an example result. The image on the left is composed by taking the maximum of a sequence of long exposure images. The center image is the minimum of the same sequence. The one on the right is the result of the subtraction. Note that the hot pixels disappeared along with the light pollution in the background. The easiest way to get the programs described below is to use the package manager provided by your Linux distribution. Gimp is the lightweight Photoshop for Linux. It's the number one option for cloning, exposure adjustment, masks, filters, etc. The learning curve of Gimp is a little bit steep at its start, so you will need some time to get comfortable with it. After that you will love it. DCraw, with the front end Ufraw, is a raw image converter for all possible camera models on the market. It allows you to control dozens of parameters when developing your RAWs to JPGs. Ufraw has a GUI, but can be used in batch mode too. You can tune the image parameters using the GUI and save the template for batch processing. This software is an alternative for Canons DPP or Nikons Capture NX. Darktable is a fancy looking tool for managing your image files and developing raws. Thanks for the info Duy Trinh! Hugin is a powerful panorama stitching program equipped with a GUI. This open source project is based on the same smart algorithms like its commercial competitors Autopano and PTGui. It's maybe less automatised but you are still able to stitch a pano with about five clicks. Hugin is highly recommended. Geeqie is the Irfanview for Linux. This very simple program is good for viewing images, slide shows, checking EXIF data or calling other programs. Xv is a very simple command line image viewer perfect for having a quick look at images or just to check their resolution. I love it, because you don't have to take off your hands from the keyboard to view an image. The development stopped many years ago and the installation might be tricky. Imagemagick's display might be an alternative. Documentation for convert. Bookmark this page or tattoo it on you chest. Home page of the SmaTrig project. This tiny gadget helps you to shoot image stacks in an automated way. Your page is full of resourceful information. Thanks for providing them to us. Addition of sample images was very useful..
see also openimageio and their command line tools, especially `oiiotool`. Darktable is absolutely worth mentioning! Very nice collection. Thank you, Luke. What about photo organization and archiving systems on Linux systems? Any advances?